The truly great writer does not want to write. in which he can live the life of the imagination. One of my resolutions for next year is to write a bit more about writing, especially in terms of developing one’s creative spirit. Getting ideas and nurturing them into written form is always our main objective as writers. However, there are times when those usual soul lifting notions seem to flop about, inspiring nothing but stress, depression and lowered levels of self-esteem. For a writer, there’s nothing worse than not getting ideas … except for maybe not getting paid! For a blogger, it’s pretty much the same thing. Face it: writer’s block happens to the best of us. Therefore, in the spirit of this season I thought I would share with you some of my own ideas stemming from my experience as a writer of various forms of ‘this, that and whatnot’. To begin with, there are two kinds of writer’s block, as far as I’m concerned. The first is when you have no idea about what to write about, and the second is when you have something to write about, but just don’t know what to say and can’t get on with it. Tips and ideas on overcoming both of these problems are provided below. 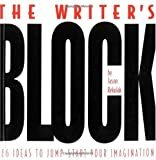 Psychologically speaking, there are different causes behind writer’s block, and sometimes understanding them can actually help you overcome the condition. For example, not knowing what to write about can be overcome by simply finding some good sources of inspiration, as opposed to trying to wrench them from your mind. On the other hand, not knowing how to get started may very well suggest you’re not organizing your ideas effectively, and are therefore being distracted by your own thought processes or anxiety. 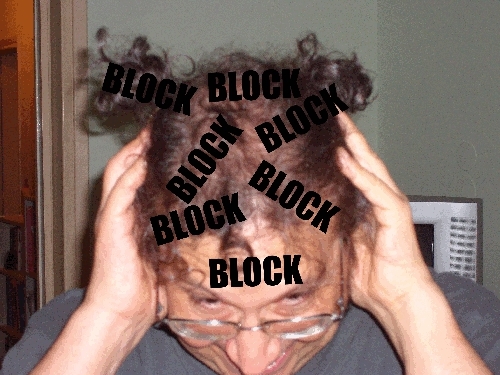 And, keep in mind that writer’s block can obviously be a result of stress, as well as, a source of further stress. In fact, if you find that your thoughts in general are sort of, well, ‘constipated’, then you are really overdue for some form of cognitive enema. Get up and go for a walk. Do something physical. Getting your blood going and burning off some of that stagnant restless energy will work wonders to restore calm and mental equilibrium. Have a glass of wine. Ok, I’m not advocating alcoholism here, or even drinking to excess. Just have a small glass of red wine or a shot of Jim Beam (my preference). It works, trust me it works, and it’s also good for your heart. Listen to some relaxing music. Ok, if relaxing music is not your cup of tea then listen to some head-banging goodness or get down and boogie woogie oogie til’ your ‘groove thing’ falls off. The point is to do something. These days my playlist includes jazz, blues, as well as healthy heapings of Laura Nyro , and of course SMiLE . I also play guitar, so sometimes I do that. If you have a pet, go pet it … assuming it likes to be petted that is. Pet therapy is an established technique for reducing anxiety, battling depression and lowering blood pressure. Most importantly for writers and bloggers, it elevates levels of serotonin and dopamine, which are neurotransmitters that calm and relax the brain so that it can process information and function more effectively. Tip: make sure your pet has been vaccinated against rabies. Go pull on yourself … unless you are religiously predisposed against doing so, in which case you can go have a bowl of corn flakes. Milk, as well, has calming properties, especially if drunk when warm (Bailey’s optional). When I’m trying to relax in order to write, I like to have some music playing in the background, or even have the TV on in the next room. I don’t like having perfect silence, unless I’m really trying to focus on writing something very technical or when I’m writing about things I know nothing about. Again, this is a personal thing, so you need to find what works best for you. 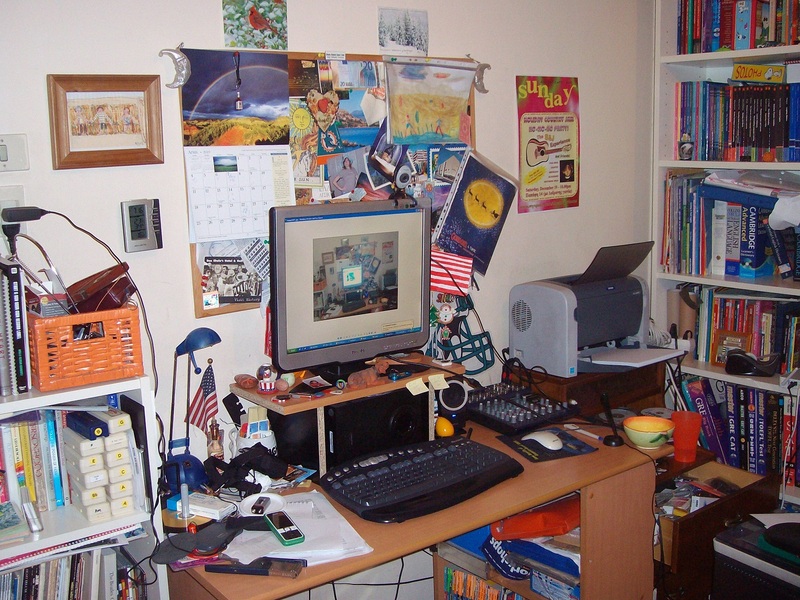 Some suggest reducing the clutter in the space around your desk. To be honest, this works for ‘some’, but not everyone. My desk is intentionally cluttered (see picture at right). In fact, in front of me is a very extensive collage of personal mementos I’ve pinned to a bulletin board over the years. It’s an eclectic collection of images of inspiring items, people and places that suggest happy times, soul centering places, and creative paraphernalia that make me SMiLE. It’s really a work of art in its own right. Often when I’m stuck or stressed, I look up and can mindslip into a short mental vacation. To me, sterile and minimalist environments remind me of a hospital or a dentist office; neither of which are conducive to creativity. So, to each his own in this respect. Lastly on this topic, consider the ergonomics of your writing desk and chair. Is your desk too high? Are you craning your neck skywards to see your monitor? Do you keep banging your knees on the underside of your desk? Think about how comfortable you really are. If you aren’t, then you are setting yourself up for elevated stress levels, distractions, and maybe even a fair amount of pain. For example, I have lower back and neck problems, so I’m very fidgety, especially when sitting for longer lengths of time. I wear out desk chairs every 6 months or so. Seriously, I’m not exaggerating! Moreover, when I’m uncomfortable I want to jump up every ten minutes or so to go raid the fridge for some ‘comfort food’. Yes, writing is supposed to be satisfying not ‘filling’, so make sure you are comfortable. With Twitter you can follow various people or organizations that are thematically related in some way. You can get ideas for posts from what’s trending and from article links that are being posted. For example, I’m on twitter and some mornings as I’m drinking my first ‘cup of Joe’ I tend to re-tweet some of the news articles I’ve just read or glanced at. Lots of people do the same. There are also many news and media agencies you can ‘follow’ on Twitter that tweet a variety of online content. Also, if you are blogging on a specific theme, look up a related magazine online and then sign up for its tweets. Doing so, should give you lots of theme specific ideas. Good writers tend to have boxes with index cards or strips of paper chock full of random ideas that have just come to them out of thin air. I tend to carry a little note pad around with me so that I can jot down an idea for a post or article wherever I am. You can also type up a quick message to yourself as an SMS message and just save it on your mobile phone. In fact, many mobile phones, and even mp3 players, have a recording function you can use to ‘take a memo yourself’ when ideas pop into your head. Wisdom suggests that it’s always a good idea to finish whatever you start, but don’t think you need to do this all at once and every time! Start one post, and if you get stuck while writing it, then just save it and go on to another one. You can always come back to the original later, when you are stumped for ideas for new posts. Again, not everything has to come out perfect on the first go. The creative process is usually a messy one, so just type up your thoughts, save them, and then revisit them later. In another post, I’ll write about how to get as many of your ideas as possible out of your head and down on paper, or computer. What it basically boils down to though is not thinking about writing, but rather just doing it. If you are a blogger, it also suggests that until you are ready to actually edit and finalize your post, just focus on drawing up ‘content’ and not obsessing on ‘quality’ early on! Don’t censor yourself or repress any ideas you may have. You can always move them around or delete them later. If you are stuck on trying to organize what it is you want to say, then try saying it out loud. Pretend you are just talking to someone and trying to explain to them your ideas. Then, just type up what you would say. Sometimes our minds get stuck when we are writing because we get hung up on trying to say something in a formal way. Usually we can just explain things better in a semi-formal or even informal fashion, orally. This technique really works for me, especially because by nature I’m a better improviser than organizer. Create an alter ego and let him, her or it do the talking. Sometimes pretending to be someone else and writing in character can give you a new perspective, as well as a whole new vocabulary. You don’t have to be too creative in this sense; you can even stick a sock on your hand and feign ‘Señor Wences‘. Playing this mind game on yourself is very useful and can be fun at times, too … as long as you keep things light and don’t get too lost in character. Trust me, I speak from experience. Know what I mean? I think y’all do. Try writing the end of your post, even if you haven’t finished the beginning or the middle. Jump around. The point here is to stay productive and to get your mind off of what’s tripping you up. You want to get your mind going again, so just try relocating it for a while. Who says you always have to start at the beginning anyway? When I’m writing, a constant problem is my coming up with ideas, that go some place else other than where I am working. As I’ve written before, I’m my worst enemy when it comes to distraction. Sometimes, the distracting thoughts are actually pretty prolific ideas in their own right, albeit unrelated to the topic at hand. When that happens, I don’t try to fight it. I just write-up those misplaced ‘flashes of brilliance’ at the bottom of the post. Later, I’ll copy them into an empty post. Tip: never fight the creative process by thinking you will remember that wonderful stray thought or notion later. Chances are you won’t, so get it down while it’s fresh in your mind. There are some who claim that the mind needs stimulation to get going. 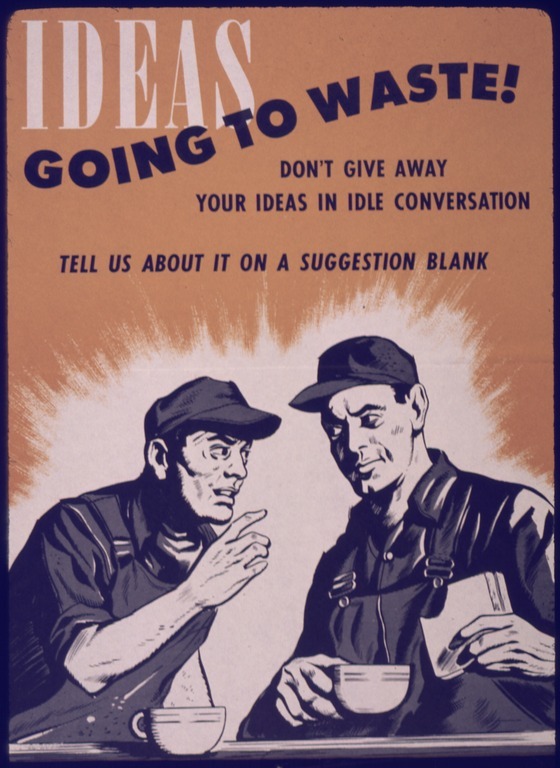 So, what I will suggest is that if have trouble writing about an idea because you are distracted by other ideas, try using a bit of reverse psychology; write about the ‘other ideas’ and see if you start getting some thoughts about your original idea you so desperately wanted to write about in the first place. I’ve tried this and I can vouch for its effectiveness, at least sometimes. When it doesn’t work … well then at least you’ve been productive and have written something you might use later. Yes, playing mind games on yourself can really work wonders! Sometimes writer’s block occurs because, and I’ll be brutal here, what you are writing is just misconceived. Play the ‘Devil’s Advocate’ game and reread your work with a disapproving and critical eye with a view to finding fault with your ideas. Try writing a bit as if you were a commenter who wanted to argue to the contrary of whatever it was that you wrote. This approach helps you to see things from a different perspective, and can also lead you to create new ideas to support your central thesis … which may also prove useful if you actually do need to cut off a detractor at the knees! Don’t take yourself soooo seriously! Give yourself a break and allow yourself to have some fun with your writing. At the very least, just try writing whatever is on your mind simply to get your mind working and those creative juices flowing. That is pretty much how this blog started. Writer’s block happens, so don’t beat yourself up over it. Make it work for you instead! Ok, I hope you find these tips and ideas helpful. If you have any suggestions that have worked for you, please comment below and let my readers and I know.